Animals can cultivate friendships just as strong as humans. Best friends forever might be a bit of a stretch, especially since some grow larger than others. Yet, we’re still utterly fascinated. Aochan and his new friend,a hamster. While it is illegal in many countries to feed live vertebrates to other animals, Japan has no such law on the books. 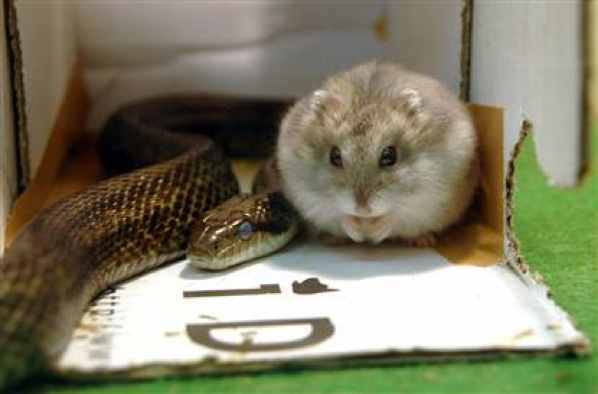 A snake called Aochan, who lived in a zoo in Tokyo, was given a live hamster to eat after refusing to snack on frozen rodents. But Aochan also refused to eat his new friend and the hamster was unafraid of the snake, going so far as to sleep on top of the animal. These BFFs became an instant attraction at the zoo and lived together for months. 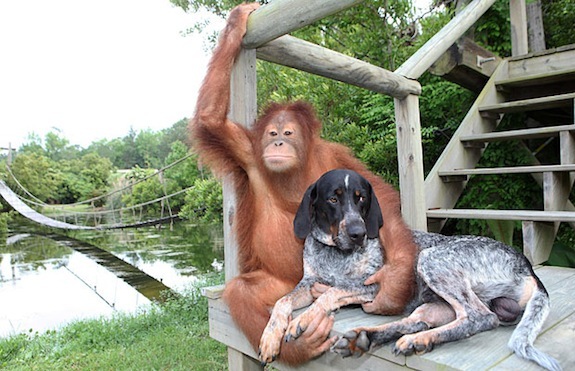 A South Carolina sanctuary is home to an unsual BFF pairing: an orangutan and a dog. The orangutan – called Suryia – actually noticed the homeless dog – called Roscoe – after it wandered into the facility. The keepers ended up adopting the dog and let him hang out with the orangutan as they prefer not to be alone. A picture book of the two friends, Suryia and Roscoe, is available on Amazon.com with funds going towards a new home for the pair. 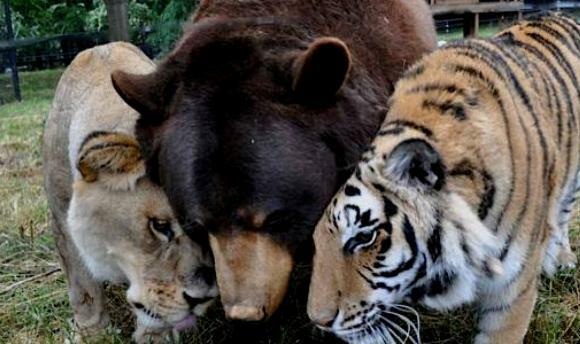 Ballo the brown bear, Leo the lion and Shere Khan the Tiger might sound like The Jungle Book characters, but they are the real names of a group of animal BFFs at a sanctuary in Georgia, USA. The 250-acre Noah’s Ark Animal Sanctuary in Locust Grove came to acquire these friends back in 2001 after they were saved from their former owner – a drug dealer who abused all three animals, known collectively as the “BLT”. “They actually seek out each other’s affection, they nuzzle each other, they play together,” said animal keeper Allison Hedgecoth.